Prime Minister Commodore Voreqe Bainimarama arrived in the Solomon Islands this morning for the 35th Independence celebration which will be held on Monday at the Lawson Tama stadium. Commodore Bainimarama met the Governor General of Solomon Islands Sir Frank Kabui and the Prime Minister of Solomon’s Gordon Darcy Lilo. He also went to the Fijian cemetery in Varamata where six Fijians have been buried. Five of them were Fijian soldiers aged between 19 to 27 years old who were killed in the World War Two in Guadalcanal. The sixth person buried at the cemetery is Panapasa Balekana who lived in the Solomon’s since 1953 and composed the Solomon Islands National anthem in 1978. His son Atueta Balekana told Fijivillage that his father was part of a competition to write the National anthem for the Solomon’s which he won. Balekana said his father went to the Solomon’s as a mechanic in 1953 and his family followed later. 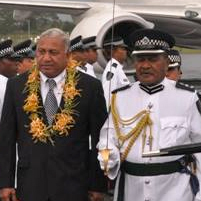 Meanwhile, Commodore Bainimarama will meet the Fijian community residing in the Solomon’s tomorrow.